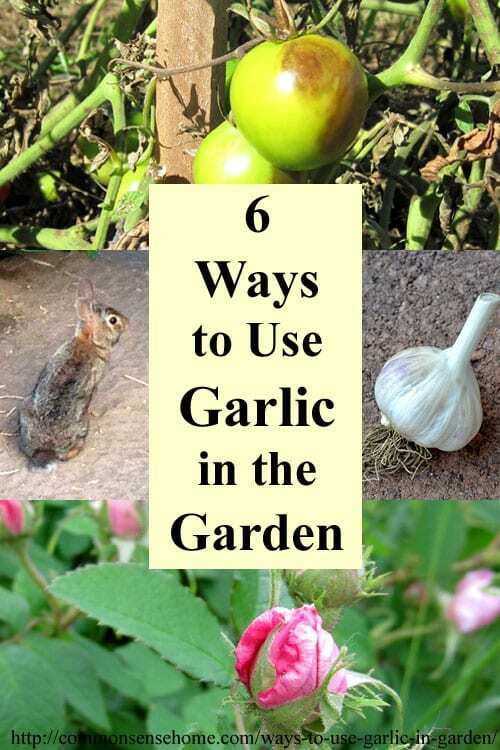 This post is for the garlic lovers – or those who aren't sure if they like garlic but do like to use natural and organic practices in their gardens. It turns out that this fragrant bulb is good for more than just cooking, and can be a real helpmate around the yard and garden. 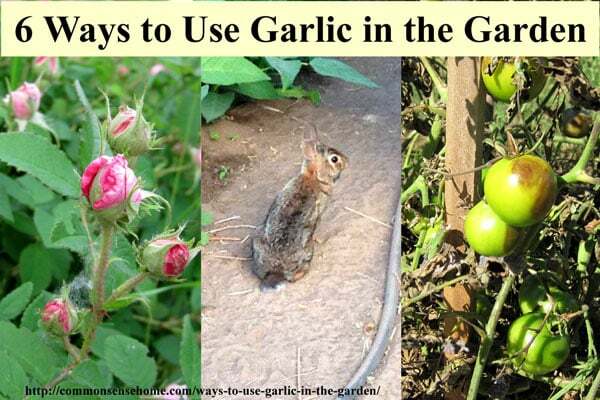 So – without further ado – 5 Ways to Use Garlic in the Garden and Yard. Garlic planted at the base of fruit trees makes a great partner in your permaculture guild. Garlic and other alliums such as chives and onions have flowers that attract a variety of beneficial insects. Their strong scent also deters browsers, and may be effective as a peach borer deterrent. From Carrots Love Tomatoes, Louise Riotte recommends teaming up your garlic with your roses and your tomatoes to keep pests at bay. She also recommends avoiding interplanting garlic with peas and beans, because alliums may slow down the growth of the legumes, but I have grown them as next door neighbors in the garden with no problems. If you spot gray or white powdery spots on your plants, odds are you're dealing with some sort of mildew or fungus. To make a simple garlic fungicide, puree 5-10 garlic cloves with a pint of water in a blender, let steep for an hour, strain, and spray on plants. 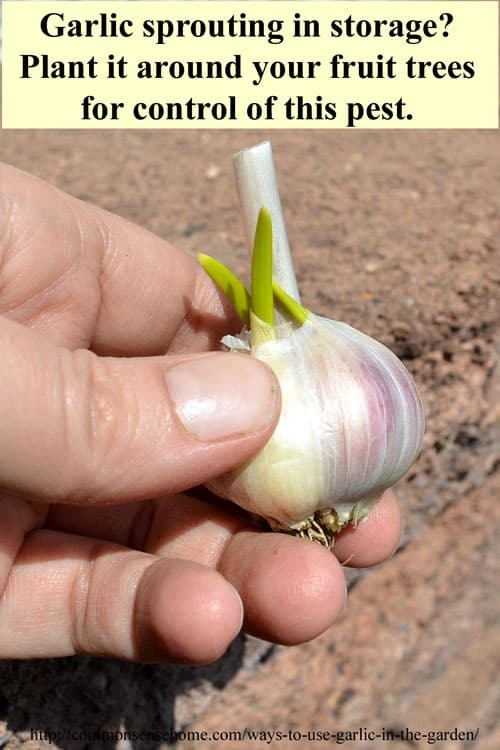 Garlic can also be used as an insecticide, so watch out for beneficial insects while spraying. Late blight is caused by the fungus-like oomycete pathogen Phytophthora infestans. It was responsible for the Irish potato famine, and has decimated tomato and potato crops in different areas in recent years. We were hit with it here late in 2010. It turns potato tubers into black mush, and makes plant foliage look like it was killed by frost. Tomatoes get brown lesions and then rot. 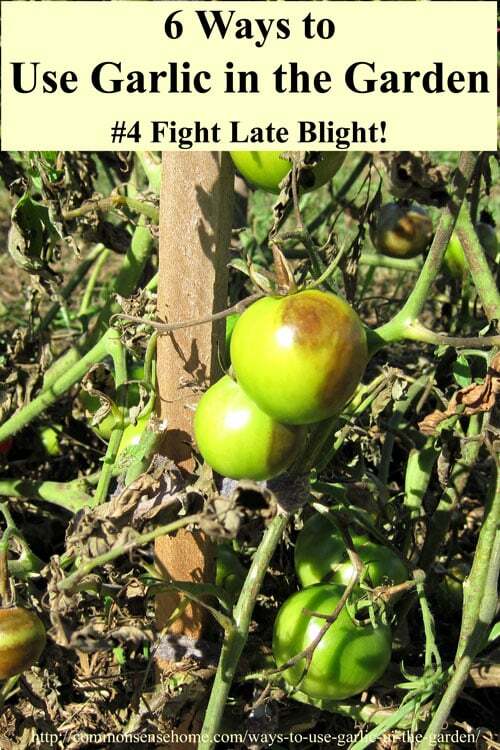 Late blight spreads the fastest in warm (60-80°F, 15.5-26.7°C), wet weather. So, even though late blight is not a fungus, it's close enough that fungicides can knock it back. I couldn't find specific dosing instructions, but the Cornell site recommends frequent, lighter applications during the growing season for general fungicides where late blight is a concern. Either the water based formula above or the oil based formula below should be effective. As mentioned above, garlic can be used as an insecticide to control a number of different insects. For pest control, use an oil base so that it sticks better to the problem bugs. Soak chopped garlic bulbs in oil for a day or so. Strain. Dissolve fish emulsion in water. Add oil to fish emulsion/water mix. Stir well. Store in a glass container. (It will react with metal and plastic.) To use, dilute one part solution to 20 parts water and spray directly on insect pests. This spray may also help keep bunnies at bay if sprayed on greens that they are munching. Bunnies generally don't care for strongly scented herbs or fish emulsion. There are now a number of garlic based oils that can be sprayed outside to keep mosquitoes at bay, such as Garlic Barrier and Mosquito Barrier. In Carrots Love Tomatoes, the author states that, “A garlic-based oil sprayed on breeding ponds showed a 100 percent kill of mosquito larvae in a University of California experiment. Note: The experiments seem to indicate best mosquito control with the garlic oil is applied to water surfaces or outside surfaces – not so much when applied to humans or eaten. That said, I know my friends who were big time garlic eaters seemed to get bit less – but it could be coincidence. Experiments also indicate that perfume wearers do attract more mosquitoes, so keep that in mind when enjoying time outside in mosquito season. And that's a wrap! If you have any other ways to use garlicky goodness in the garden or yard, let me know. <br /> <br /> <br /> Originally published in 2015, updated in 2017.
re: garlic – I remember that when I was growing up on a smallholding in Wales, my mother used to put a couple of peeled garlic cloves into the the chickens’ drinking water to minimise parasite infestations. Thanks for sharing! I know some commercial chicken farms have been experimenting with oregano, too. I’ve read that planting garlic around the perimeter of your yard will help prevent snakes entering, too. We don’t have poisonous snakes in our area and our yard area is really huge (and I like snakes), but that would be an interesting experiment to try in an area with dangerous snakes. I would like to ask you a favour as to where would I get Canberries plants. I cant find them in ontario, canada. Please can send me a email on that issue if you don”t mind. 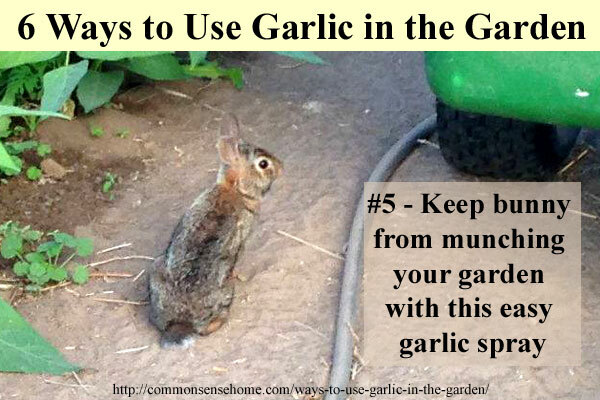 you didn’t really say “how to use garlic” to deter rabbits? That would be the pest control section. I’ll modify the post to make this clearer. I wonder if a garlic spray would work just as well and be easier to apply? Our kitties love freshly tilled soil, too, even with all the many other places they could do their business. Thanks for sharing! Great article and helpful comments. I wonder with frequent rain if I would need to reapply the garlic spray, if so how frequently? Should I store leftover oil or water based spray in fridge or freezer? It’s hard to say exactly how frequently it would need to be applied, because that would depend on the rain. Try tasting a leaf of whatever you’re treating. If you can taste garlic, critters can, too. If not, reapply. For short term storage (a week or less), fridge should be fine. For longer storage, go for the freezer – especially if you try the plant licking option.